I have returned to work for 3 half days a week. Well in fact more like 3/4 days by the time paper work is done and arrive home about 2.30-3pm. Getting my nappy brain into gear has being a bit of a challenge to my confidence. However I have been reflecting on my consulting style and finding now as a mother how this tempers my approach. I have been doing this now for 16 years. Hard to believe. You get to see the highs and lows of humanity. Overall it has been a privlege to be part of people's lives. To have their trust. There is a cohort of patients that I really love to see. Women of a certain vintage that are still standing strong. Often they are widowed or have never married. They are of average age 83 years. They are fiercely independent. They usually don't have much wrong with them, usually on little or no medication and have some strong but simple health beliefs. They never complain about being "tired" and don't request a full body CT scan or serum rhubarb (medical slang for every test under the sun). They often just come in for a chat. More like a social visit. They often live alone and many of their friends have passed away. I love listening to their take on things and they give me great advice about being a Mum and raising children. Pop over to Maxabella for more thoughts on weekly gratitude. I am thinking that your 'vintage' patients would feel a sense of gratitude towards you,for feeling they can talk with you,and that you listen. We can learm so much from the wisdom of our elders..if we listen. What a picture! 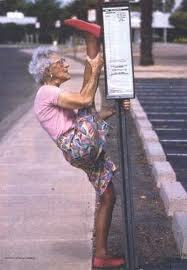 I hope to be a bubbly old 83 year old one day... but I doubt I've ever been that flexible! I bet you miss little man those work days but it's a good decision, a good balance for you both. They are lucky you are there. I bet they are amazing, i just love those ladies & very much look forward to being one. I will voice my opinion, attend the Yoga classes & hopefully be on little to no medication too. So hope to not be alone, i'm so grateful my parents still have each other in their 70s with 55 years of marriage under their belt, i watch my father-in-law grow into old age alone, its been 12 years since we lost my mother-in-law to breast cancer, so unfair they didn't get to complete their love story.